The west African nation of Mali gained independence from France in 1960, when photographer Malick Sidibé was either 24 or 25—he's not sure what year he was born. Sidibé says he grew up a "peasant child who raised animals" and began taking pictures professionally after getting a job with a society photographer. He opened his own studio in Mali's capital, Bamako, in 1962. It was an auspicious time to be wielding a camera, given the postindependence revolution in style. 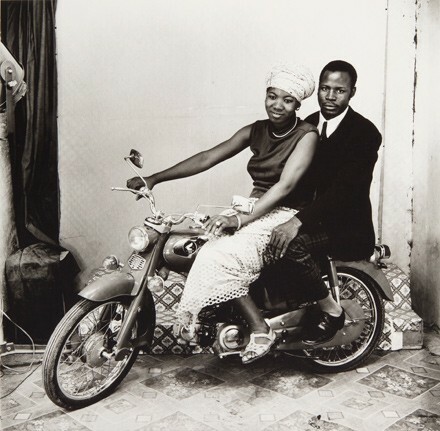 An avid chronicler of the new cool, Sidibé came to be called the Eye of Bamako. Some of his many photos are collected in a new DePaul Art Museum exhibit, "Studio Malick." They show pop culture seeping into Malian life. Sidibé was especially interested in Western-style dancing, a new pursuit in Mali at the time. On weekends he'd go to four or five parties a night, shooting happy young couples doing the twist and the cha-cha. "We were entering a new era, and people wanted to dance," Sidibé says. "Music freed us." His studio images are playful: in one particularly trippy shot from 1976, Pretending to Smoke, two earnest young men pose before a vertical-striped backdrop in vertical-striped, bell-bottom leisure suits, cigarettes dangling from their mouths. The Two of Us on a Motorcycle (1970) portrays a couple sitting on the titular vehicle. She sits in front with her hands on the handlebar grips and looks happy. He sits behind her and looks solemn.